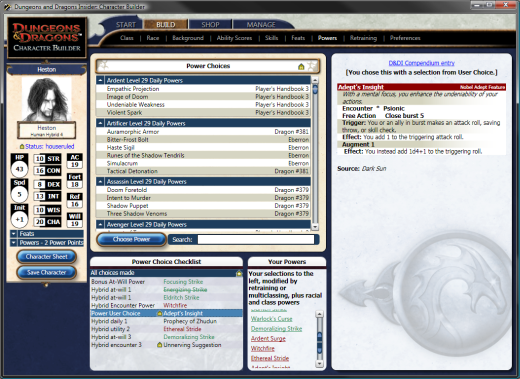 Playwrite: Adding real custom content to the 4e Character Builder: Can it be done? Yes, and I’m going to tell you how. Actually, I’m just going to point you in the general direction. Disclaimer: I, in no way, condone or support reverse-engineering the Character Builder or its associated libraries. I also cannot condone redistribution of any Wizards-owned IP or content. The greatest failing of the official 4e Character Builder from Wizards is its weak support for homebrew and custom content. For such a powerful and mature tool, it’s an incredible shortcoming. In addition, the recent (and second) delay to the September refresh of the CB highlighted the fact that players are at the mercy of Wizards for rules updates. Without WotC’s regular software support, the CB quickly falls out-of-sync with new books and Dragon/Dungeon magazines. For those on the cutting edge of the game, it’s fairly crippling. Recently I came across a Google Code project called cbloader. It’s a fairly simple C# application that decrypts the “combined.dnd40.encrypted” file, extracts the rules database from it and writes it out as XML. You can then use the app to instruct the CB to use the XML instead of the encrypted file for its ruleset. This XML is completely editable. At any time you can redirect the CB back to the encrypted file, so you can have a modified database and the original running in parallel. In essence, it allows you to update the CB yourself, or put in proper custom rules fully supported by the application. With colours and bonuses and all. Obviously, if players could add their own content to the CB (including the official stuff) there would be little reason for them to purchase the monthly updates, except for major rule changes (such as with Essentials and the September CB refresh). That, and saving yourself the hassle of typing in all the new content, which is significant. I’d like to clarify that I am not at all associated with cbloader – it’s just something I came across. If you’d like to take a look at it, go right ahead. I can tell you now, out of the box, it won’t work, and I don’t feel comfortable explaining how to fix it. I will say that anyone with reasonable experience with programming, particularly C#, and some familiarity with reading and writing to process memory should be able to get it operational quickly, after which it will do exactly what it says on the tin. As for manipulating the XML itself, well, that’s another can of worms entirely. ~ by Logan on September 27, 2010. Since I’m not very proficient in programing (I only have a 1, so to speak), where might I go to find out how to get the CBLoader to work? anyone know of a site that uses this to update the official stuff and/or allows for > level 3 editing?